Arrow consists of five Strategic Product Design students aiming to combine their unique design capabilities to help companies in portfolio extension. The team draws on their strengths from different backgrounds to help companies innovate and grow. Some of our team specialize in branding, while others have strong skills and experience at the product level. Together we use visualization and materialisation skills, empathy, as well as design a business communication styles to guide companies from a small portfolio to a strong brand. Arrow uses design thinking methods to match clients needs with feasible outcomes (Brown, 2008) . Arrow consultancy answers a common problem for its startup clients. Entrepreneurs and small startups often start with great products and service, but are unclear how to growth their businesses beyond their initial successes. Sadly, many startups simple expand on their existing product, making a small version or a different color, or simply fade out of their consumers’ field of view. To survive, companies need to extend their product line and adjust their brand accordingly. This requires startups to fully understand the meaning behind their brand which allows them to create aligned, meaningful innovations for their customers. In other words, we help companies understand why they do what they do, by finding the brand they already are to take the next steps. For young companies who have positioned themselves in the market with one product/service. Arrow is a design consultancy which helps clients identify the uniqueness on which to build their portfolios, using visualization and materialization capabilities to clarify market and future direction by bringing awareness to their core strengths and surfacing hidden problems. The recent success story of Senz umbrellas is a clear example of Arrow’s ideal client. Senz success rest on one product, their storm umbrella. Recently, they built on this product by introducing a folding model and are now expanding their business to Asia. However, to stay competitive, Senz needs to transport their one product business into a cohesive brand of products. Before Senz can expand their product into a brand, they need to understand understand why they do what they do. Arrow can help Senz finding the brand they already are in order to take the right next steps. 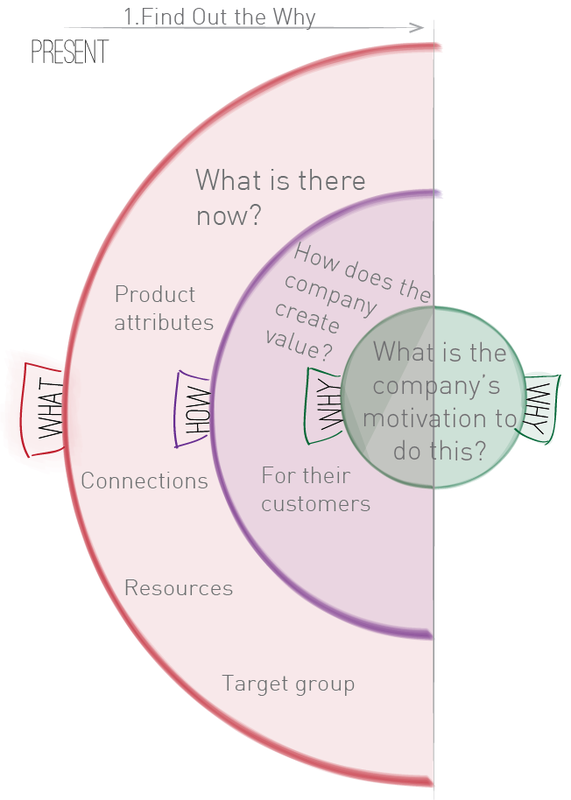 Arrow uses a What, How, Why model, inspired by Simon Sinek’s (2009) golden circle, to help startup companies expand their portfolio. According to Sinek, the golden circle defines why successful companies are able to outperform their competition and inspire customers to buy several products from that same company. How are we going to use the why-how-what? We believe that young companies that have peaked with one product and are looking to expand their portfolio, should first determine what their ‘why’ is. What is the true identity of their company on which they should build? What makes them unique? This is based on the company-product relationship. By first determining this relationship and what it means, it later on is more convincing to bring out to the customer. However, exactly because these companies have only had one successful product/service on the market, their ‘why’ can be uncertain. Figure on the left shows how we anticipate to this. At Arrow Design, we want to guide our clients through the golden circle by a two step process. The first step is based on the present: it is getting them from the ‘what’ (the existing product/service) to the ‘why’. The second step is future oriented; it uses this true identity as a starting point to work towards ‘new whats’ again (see figure below). 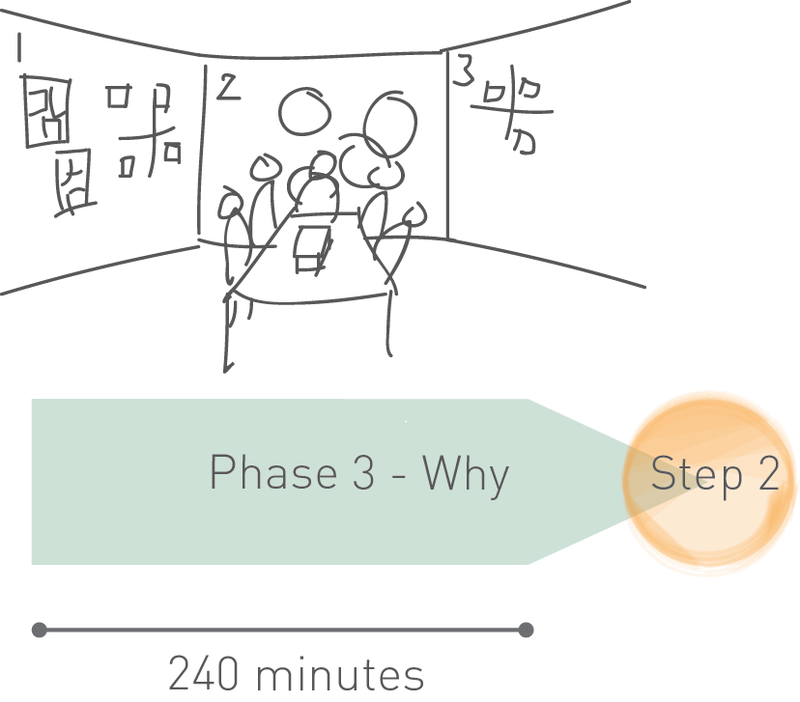 It could be the case that the second step of the process results into unexpected new directions that wouldn’t have come up motivated only from the existing product. In case of the example of Senz, the first step would guide them from the original Senz umbrella towards their core uniqueness as a company; their ‘why’. For Senz their “why”could be: We want to provide protection in extreme weather conditions. 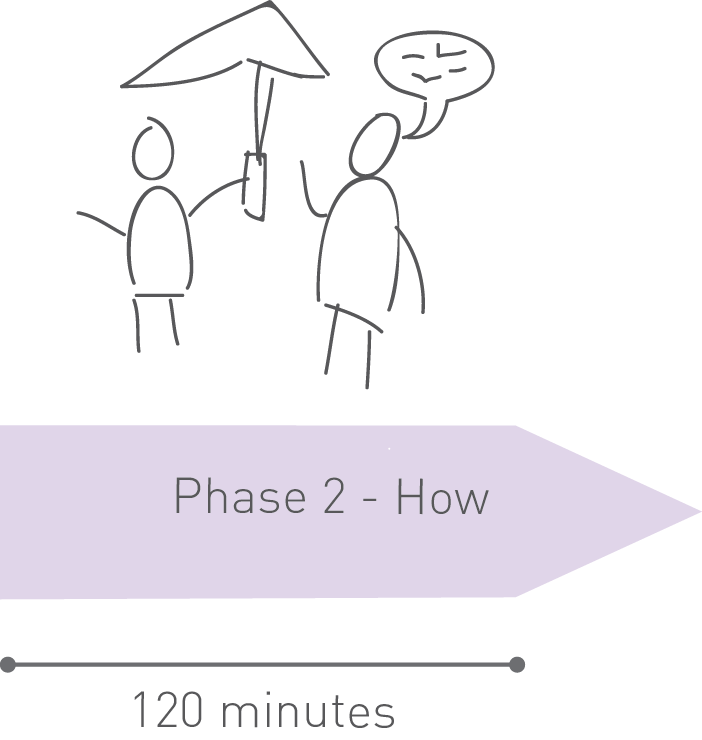 The end result of the second step could take form as another type of umbrella but could also be high end raincoats, umbrella holders for your bike, backpack covers or even a weather app. A company that succeeded very well in expanding their portfolio following a same kind of mentality is Fatboy (see figure on the left). Fatboy started with their fresh beanbags but eventually came to a point where the question ‘what’s next?’ rose. Motivated not only from ‘sitting comfortably in a beanbag’ but from ‘Bringing a cool relaxing moment to everyone everywhere’, they expanded their portfolio. They now also sell lamps, picnic blanket, and hammocks, which are totally different products but still fit the core of Fatboy very well. In what way does this method differentiate from others? The two methods also differ in the end result. 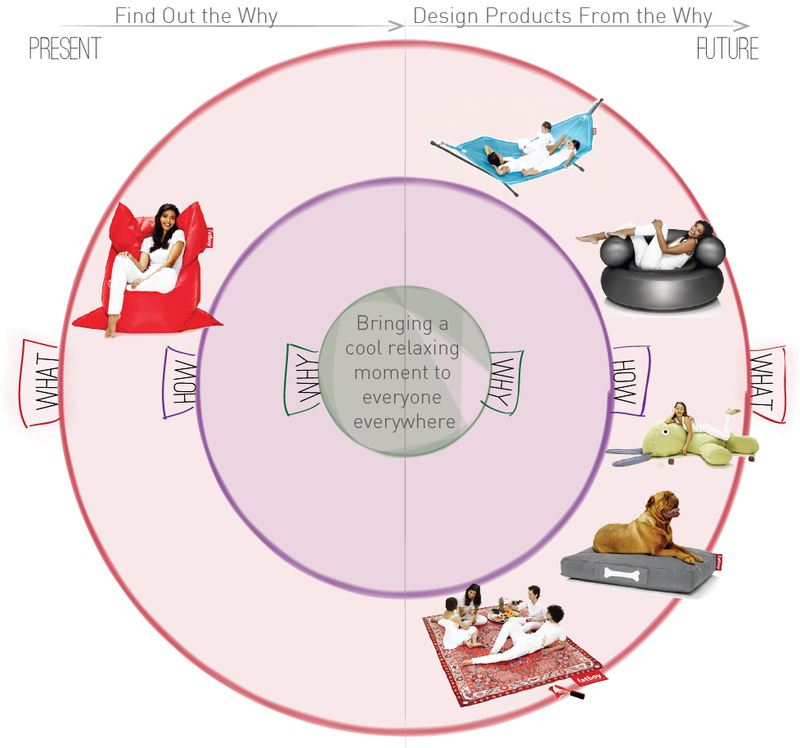 Where VIP aims for designing only one new product, the ‘why’ aspect can be used as a starting point for several new products in the portfolio. Also, VIP is much more focused on solving a design problem so it can be used as a tool to design one product whereas our method focuses on the motivation behind the product. So actually, our method starts at an earlier phase and after that a method (tool) like VIP that focuses on the context can possibly be used in steps after that. Our workshop guides company participants through a two step process, leading to novel idea generation and value creation for new customer markets. We do this by using our unique capabilities in visualization, materialization, use of empathy, and ability to speak both design and business languages.We chose to develop the first step of the two-step process in more detail. 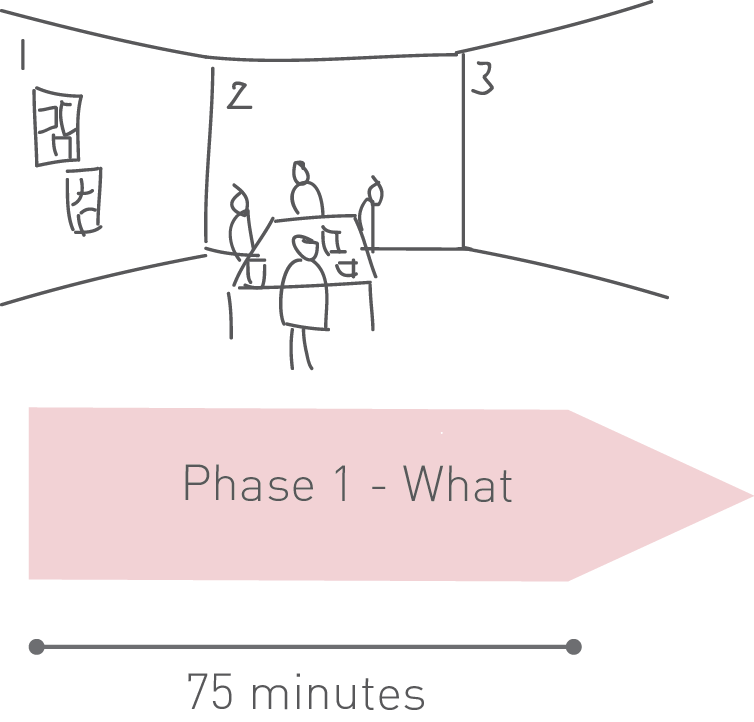 This is the step that is based on the current situation and uses the current product or service to get to the ‘why’ through a creative workshop. An overview of the workshop can be seen in the figure below. In the first step, we guide members through three distinct phases, which help them clearly define what, how and why they operate. We typically work with group sizes of between five and ten members during a one full day session, which takes place in the office space of our clients. Our workshop setup is simple; we require four walls, a table and an open mind. We use each wall to cover each phase of our workshop. Beneath the phases are explained in more detail. Our workshop begins with an introduction lasting about twenty minutes. We explain our goals for the workshop as well as rules, the different phases. We also emphasize the members already possess everything they need to transform their single product or service business into a multi-product or multi-service business. We ask the members to communicate their expectations and write down a personal vision statement for their company, which will be utilized later in the workshop. We facilitate an ice-breaker by asking the members to write down something embarassing that happened lately. Each member reads out loud the story, and collectively, the members guess who wrote it. Humorous interactions will help both Arrow and the client members get to know each other and reduce stress. Leidtka (2014) describes flaws in cognitive processing and consequences for innovative problem solving. During the ‘What’ phase of ‘The wall’ workshop the bias of egocentric empathy gap will be important. This means that a company projects its own preferences onto others. An important question during this workshop will be: What do they see as value and what sees the customer as value? Internal idea generation: This will uncover topics, such as team dynamics, work methods, design approaches, idea evaluation, interpersonal relationships, power structure. Product pitch to an investor: This will uncover topics, such as how company value proposition, how they speak about their brand, perception of investors and customers, their relationship with investors, relevant past experiences, and power structure. Business to business sales conversation with a store owner / spontaneous interaction with a customer: This will start with a short introduction by the customer, followed by the play. This will uncover topics, such as the company’s perception of their customer needs, what they think is valuable for the customer, customer interaction, and target market. During the discussions in between the plays, Post-its will be placed on the second wall. When the plays conclude, the group will have a closing discussion and cluster Post-its into families. This will help to surface assumptions and problems about how the company functions and how they create value for their customers. Arrow will allot 120 minutes for this phase. Phase three will build on this information from phase one and two. Some start-ups are founded by two people from different backgrounds. Beverland and Farrelly (2011) describe the problems that could occur between a designer and a marketer and also present a three-step process to overcome this problem. When such a problem exists for a client of Arrow, they can use this process to build a shared understanding. With the help of role playing they can recognize and empathize with the other’s frame. Phase three will focus on leading clients to a clear motivation statement. The clients will utilize the third wall in this activity. Arrow will arrange a canvas on the wall with four blocks: the company (including method of how they do things), the product or service (attributes and use), the competitors and the customers. Arrow will ask the clients to put the top three most important Post-it notes for each block on the wall from phase one and two. If the clients already have a motivation statement, Arrow will compare the newly derived motivation statement with the current statement to compare and contrast to offer an objective view point. The clients will then work in small groups to visualize the new statement and make it tangible designing a box that communicates the identify statement, as if the statement is going to be sold at retail. The clients are given cardboard, scissors, glue, colored paper and pencils. Together they address core concerns such as product name, hooks and tagline to entice a consumers, features and functions, as well as connection and value to customers. Arrow will facilitate a discussion on the boxes and compare the identity statements now to the ones written in the beginning of the workshop. 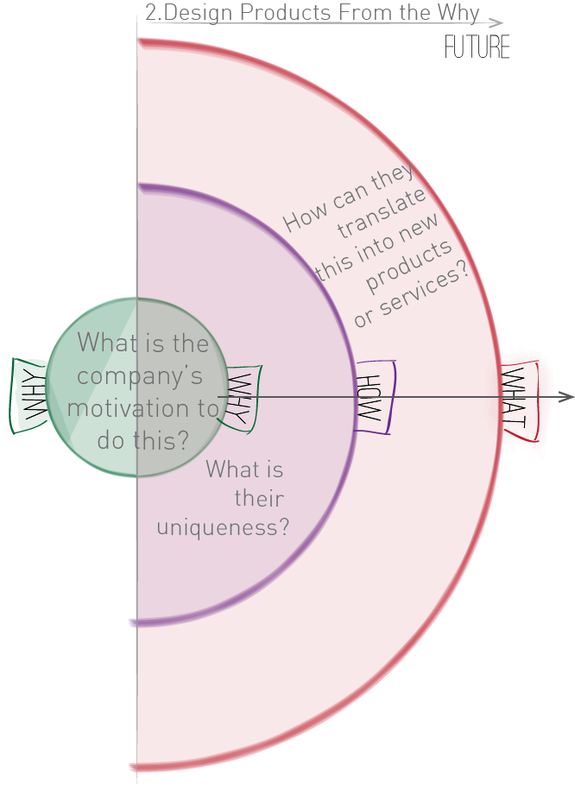 Following the discussion, Arrow will explain how the clients can work with this new motivation statement to create new product or service concepts in a second workshop using Arrows unique creative methods. Arrow will allot four hours for this phase. Phase three concludes the workshop. At Arrow, we guide the company through this three step process. With the help of our design capabilities we give them insight in their vision and motivation statement. With this statement the company can design new products and expand their portfolio. Liedtka, J. (2014). Perspective: Linking Design Thinking with Innovation Outcomes through Cognitive Bias Reduction. Journal of Product Innovation Management. Calabretta, G. The Interplay Between Rationality and Intuition in Innovation Decision ­Making: A Study of Practices. .
 Brown, T. (2008). Design thinking. Harvard business review, 86(6), 84. Alexander, C. (1964). Notes on the Synthesis of Form (Vol. 5). Harvard University Press. Hekkert, P., & van Dijk, M. (2011). ViP-Vision in Design: A Guidebook for Innovators. BIS Publishers.